Beta Theta Pi is dedicated to building Men of Principle for a principled life. Membership in Beta enhances each brother’s collegiate experience through intellectual, social and moral growth. 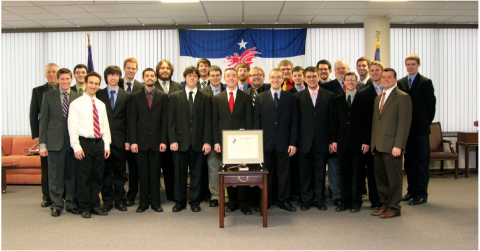 Beta promotes high standards of moral conduct and responsible citizenship as outlined in the Men of Principle initiative. The Men of Principle initiative is built upon five core values. Brothers help and support each other through mutual assistance, strive for academic excellence through intellectual growth, trust one another, maintain responsible conduct in all of their actions, and stay true to their beliefs with integrity. These values are key to preserving the 173-year old ideals of our Founding Fathers. Download the Men of Principle Scholarship application.